I have to confess to being a little puzzled about David Cameron’s ‘Big Society’. The term appears to have been coined originally as a rhetorical antithesis to the bogey ‘Big State’, but we have had to wait to see it cashed out in terms of substance we can understand. If it is not to be simply a slogan, what does it actually mean? It is already painfully obvious that the politicians who so loved the freedom of Opposition are now having to endure the ordeal of accountability. This coalition government has had the courage to address hard economic challenges (even if their solutions beg many questions – such as why the financial measures that got us into this mess came about in order to rescue banks which are now making huge profits which don’t seem to be paying off the debts incurred by the public purse…) and is approaching some issues with fresh vision after several years of stale over-legislation. But, the concept of the ‘Big Society’ has remained somewhat elusive. It feels as if what began as a mere rhetorical device has had to be filled with some sort of content after all… but simply being posited as the opposite of what we had before (as certain ideologues would see it) is clearly not enough. Cameron’s speech in Liverpool offered a good start at helping us understand his ‘passion’. But it was striking for two reasons: (a) yes, it is a concept capable of some really interesting content, and (b) it has already been going on (largely unrecognised) under his nose for decades. Commentators have been questioning whether the ‘Big Society’ is a concept or simply a con. Bloggers have launched in, too – sometimes helpfully identifying the right questions to be asking of the concept (or con). But, what is being missed is the recognition that what Cameron wants, the Church already does. He is walking on our territory without realising we have been there for years. It is what we do. More people do unpaid work for church organisations than any other organisation. Eight per cent of adults undertake voluntary work for church organisations while sixteen per cent of adults belong to religious or church organisations. A quarter of regular churchgoers (among both Anglicans and other Christians separately) are involved in voluntary community service outside the church. Churchgoers overall contribute 23.2 million hours voluntary service each month in their local communities outside the church. The Church of England provides activities outside church worship in the local community for 407,000 children and young people (aged under 16 years) and 32,900 young people (aged 16 to 25 years). More than 116,000 volunteers and an additional 4900 employed adults run children/young people activity groups sponsored by the Church of England outside church worship. Church of England congregations give more than £51.7 million each year to other charities – that’s even more than the BBC’s annual Children in Need appeal. More than half a million worshippers subscribe to tax-efficient giving schemes such as Gift Aid, accounting for half the voluntary income of parish churches. It is easy to hear David Cameron and his colleagues speaking as if we need to begin creating the ‘Big Society’ when it is already here, but unappreciated. It’s about saying if we want real change for the long-term, we need people to come together and work together – because we’re all in this together. But, we are not. Some people and some communities are ‘in it’ more than others and some are replete with the resources and skills to make differences less likely elsewhere. Not long ago, four parts of our country – Eden Valley in Cumbria, Windsor and Maidenhead, Sutton and here in Liverpool – came to us and said: ‘we want more power and control. You’ve spoken about it long enough. Now give it to us’. Really? I cover Sutton and so far I haven’t found anyone who remembers saying anything of the sort. Watch this space and join in the debate. It’s going to be an interesting ride. Good post, really encouraging and insightful. I’m relieved I’m not the only one slightly puzzled by all of this talk of a “big society”, and let’s face it there has been much in the way of talk. I’ve read many opinion pieces (some have included the religious aspect), however, I’ve stayed away from this so far, but would like to cross-post this one if that’s OK. I don’t see any reason to be puzzled about Cameron’s ideas. Rightly or wrongly, he intends to reduce government spending on public services, and he wants volunteers to do it for free. When I started doing voluntary work I learned that to replace the voluntary sector with paid staff would require a tax rise of 10 pence in the pound. I’m glad that Christians take their social responsibilities so seriously. I gather that Buddhists, Hindus, Pagans, Rastafarians, and even Moslims, are quite nice people as well. Not every church is as welcoming and accepting as the ones I’ve had the privilege to encounter in the last few years. Not every church has the same commitment as the C of E to being present in every community. It’s so very easy to start rationing care based on what people believe, rather than based on their need. That’s bad theology as well as bad public policy, but I have no doubt that it happens already and will get worse as government services are pared back. I’m not inclined to be wary about the motives behing the ‘Big Society’ idea because I think it’s too big an issue to be simply a government money-saving exercise. There is a philosophy here about human beings being in community and taking responsibility for each other directly. Interestingly, the Irish Catholic newspaper columnist, Mary Kenny, says this week that she understands the ‘Big Society’ idea, adding: “but that’s probably because it is not entirely dissimilar from Catholic social teaching as propounded in the 1950s and 60s”. I think there is a big idea here and I’m glad the PM has championed it. As Bishop Nick says, the ‘Big Society’ concept promises to be an interesting ride. I hope people will take it up in a positive way and give it a chance. Less than a mile from where The Archbishop of Canterbury gave ‘Two and a half cheers’ for the Big Society last night is our local community which you know. It is a living example of the Big Society that for 40 years has maintained All Hallows Copperfield Street Community Garden in SE1. Unfortunately it is the Church that is trying to destroy it. See http://www.saveallhallows.com for further information. For the third time Colin Slee, the Dean of Southwark Cathedral, will be submitting plans to redevelop All Hallows Church and Community Garden with private flats that will box in our estate and reduce our light and privacy. The proposal could also ruin and end access to our award-winning walled community garden that was created from a WW2 bombsite by local residents and maintained by us for nearly 40 years. Once again the Cathedral has ignored the voices of local people by refusing to consult before submitting their new plan even though we submitted an alternative proposal to help them find a solution. Dr Rowan’s support for local communities is undermined by Colin Slee ,who has demonstrated once again that he has no vision of society – let alone a big one! I’m probably missing the point but I find the sight of Christians – who do or should understand the complex nature of volunteering – falling over themselves to applaud the government for this simplistic initiative rather disheartening. As my son pointed out yesterday, the Prime Minister telling people to change society from the grass roots shows a somewhat muddled grasp of how the grass roots work. Volunteers actually require a lot of resourcing and support to work effectively (and safely), so to make Big Society work a lot of money will have to be thrown at it. I’m afraid I see this as a ‘do as I say, not as I do’ exercise and as such completely futile. Of course Dave’n’Nick might be planning to spend their Saturday afternoons volunteering in a contact centre for the next six months, in which I take it all back. I have spent most of the last twelve years living and working on the Monks Hill Estate in Croydon, working with residents to build community and acting as a good adult role model to a number of the young people living there. I was devastated in 2005 when one of the young people I mentored was stabbed to death. It was this incident that made me realise that we needed a new approach to re-build our society. A couple of months later I heard the then Shadow Education Minister speak at a conference. 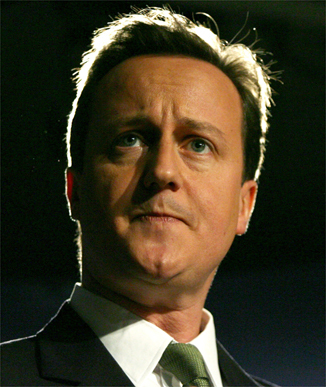 His name was David Cameron and he spoke passionately about the need for a Big Society to rebuild our communities. As I listened to him speak I knew that this was the new approach I was looking for. I spent the next three years working part time for Iain Duncan Smith at the Centre for Social Justice to make sure the vision became a reality by preparing practical policies that can be implemented. I know that David Cameron has passion for his Big Society plan. I also know that the Church has the experience to make it work, but she must not hide her light under a bush, instead she must put it on a lamp stand. If the Big Society is going to work the Church must be at the very centre of the plans and take a lead in implementing them.